Use the Loop Block, along with the Loop Exit Block, to add a simple loop in your Map. The Loop Block is similar to an infinite Do-While loop. A Loop Exit is always required within a Loop Block. Loop, along with Loop Exit, is generally used with an If/Else statement to loop until a condition is met and then continue processing the next Block outside the loop. 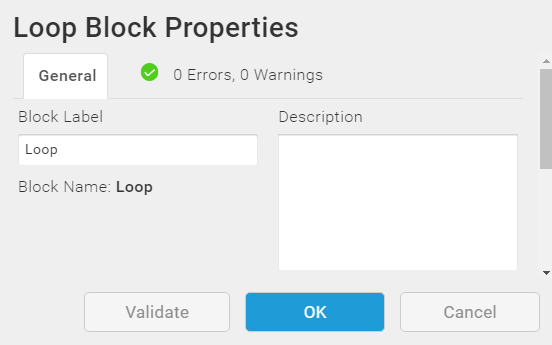 Note: In TIBCO Scribe® Online, the Loop Block is set to stop after ten thousand (10,000) iterations. If you need to change this limit, contact TIBCO Scribe® Technical Support. If salesorderid equals salesorderdetailsid, meaning if the Detail record is a child of this Sales Order. Then, insert a new salesorderdetail record into the target. Else, end the loop and continue to the next salesorder record. Tip: Unless your Map is designed to get a new record, TIBCO Scribe® Online processes the same record on each iteration. Note: To improve the readability of a Map, select the collapse ( ) or expand ( ) icons on the Block to display or hide all of the Blocks included within the selected Block.